Elevate your nightly experience with this premium 12-inch memory foam mattress. Crown Comfort's memory foam provides a great sleeping surface. In normal temperatures it is somewhat firm, but when you lay down, it starts reacting to the temperature of your body and begins to mold itself to your shape. Then, weight is evenly distributed along the surface, relieving pressure points and helping you to sleep more without tossing and turning. A significant feature of this mattress is our pressure relief system that you can actually feel when you lay on the mattress. Special areas inside the mattress are accommodating to the areas of your body that create pressure points: Your shoulders and hips. The pressure relief foam really does minimize these pressure points. Pressure relief system virtually eliminates all pressure points to ensure a comfortable night sleep. 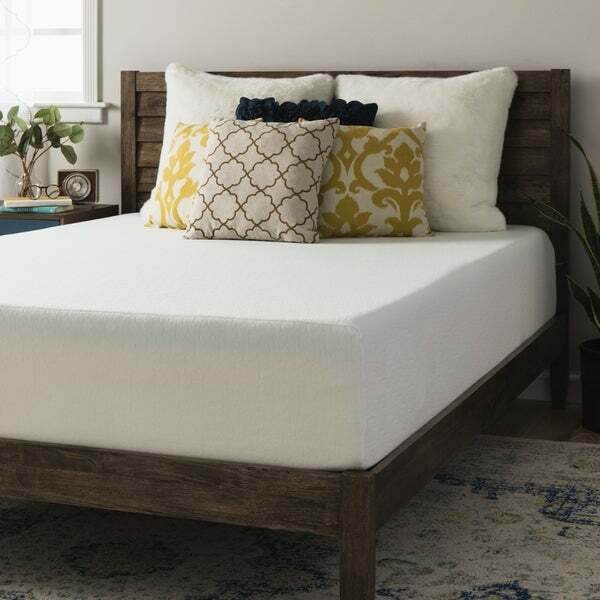 Mattress layers: 2.5-inch Memory Foam 3-inch Super soft foam with pressure relief system 6.5-inch High-Density PU Foam. I was really not sure about buying a matress online that comes in a box, I didn't want anything too firm. But my boyfriends matress was ruining my back and neck, it was way too soft and lumpy. And we didn't have the money for the overpriced temperpedic memory foam matress we had always wanted. After reading tons of reviews I chose this one. I'm glad I got the 12 inch matress instead of the 8 inch, not sure if it makes a difference in comfort but I didn't want the bed to be too low to the ground. After opening the packaging the matress grew to its full size within a minute, there was no smell or anything. It was a little stiff at first, but I ran and jumped around on the bed until I was tired and it helped break it in perfectly:) my boyfriend and I love it it's conforming and supportive I can finally sleep flat on my back comfortably. Seriously can't beat this price for a king size memory foam bed. My husband loves our new mattress. I think it is very good with an excellent price point. He loves how comfortable and firm the memory foam is, but I prefer the conform to your body variety of memory foam. I wanted to try a former mattress due to my bad lower back, so far I don't feel much of a difference from our traditional mattress as far as back pain goes. It has only been a few days, so I am keeping an open mind. I do love that my husband and I can get out of bed without waking the other. The memory foam makes that easy. I recommend allowing 2-3 days for the bed to fully inflate before use. I would also open all windows and let the mattress air out. The smell is not terrible, but there is a definite odor. The bed wasn't cut to perfect dimensions and some corners are more rounded than others. Loss of 1 star. Although, my bed sheets still fit over well. I had a foam mattress before that was a little more stiff. I got used to it and I feel this one is more soft. The 2.5 inches of foam lets your body sink into the bed. I also feel this bed runs a little hot. It's winter so it's not bad right now. I will have to wait and see how it is during summer. Overall the bed is OK. I spent weeks looking at reviews on beds. This is soft and comfortable. Let's see how it olds up in 5 years. 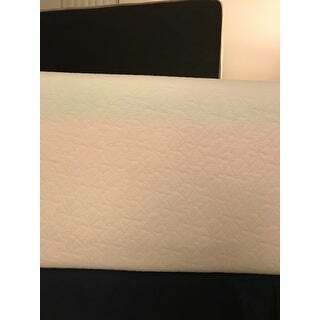 I replaced my pillow top mattress with this memory foam mattress. My back pains stopped with the first night's sleep. The mattress out of the box was ready to sleep on within an hour and there were no unpleasant smells. The medium firmness is perfect but firmer than I'm used to. We purchased about 10 mattresses for three homes from overstock and the more you pay for memory foam the better they are. Price between $700-$1000 for memory foam king size will give you an amazing bed. We love the medium firmness. Soft mattresses are hard to sleep on especially when two people sleep in one bed. This purchase was for my daughters room. It arrived rolled up in a box and I followed the instructions which was to remove from box and lay flat for 72 hours to allow to inflate. After inflation, it is a beautiful mattress. It is very comfortable to lie on and the memory foam stays cool at night. Thinking of purchasing another for my other daughter. Was leery of my purchase because of the low price but once I received it, I was pleasantly surprised how comfortable the mattress was. It was being used in our guest room and already had guests sleep on it and like it so much that they are returning their $1,000.00 mattress they just purchased and are purchasing a Crown Comfort 12-inch mattress. That is a pretty good testimonial, I would say. Shipped quickly as well. Very pleased with our purchase. Received my mattress today, no damages, which was good. As you can see the mattress expanded the full 12 inches. I laid down on it a couple of times and it feels just great. Can’t tell yet on how it will do. I will sleep on it and continue this review. Great mattress! Easy to open form the box and inflate. However it looks like when inflated it was not completely 12 inch. Not sure whether I did something wrong on my part while opening. Got this for the guest bed room, so no one has slept on it yet. Love Love Love!!!! My back hasn't hurt since buying it!!!! I ordered this for our guest bedroom. My mom slept on it for a week and was very pleased by how comfortable it is. To me it feels like sleeping on a marshmallow. I also like that the bed has some height. I received this mattress about two weeks ago and so far I love it. It's more comfortable than I expected after reading some of the other reviews. It's firmer than some mattresses but not rock hard either, somewhere comfortably in-between. Warning though, the mattress is HEAVY. I needed the help of two other people to get it up the stairs when it arrived. Overall, extremely pleased with the purchase. Very comfortable mattress. Great delivery. Follow instructions for unpacking. Always amazed how the mattress expands. Very little odor that dissipated over a few days. This is the 4th mattress I purchased from "O". Been pleased with each of them. Very nice for the price ! Thus far It has served the purpose of its use,my son is enjoying this comfort,and he is not a small man, so he has not had any complaints. Came on time easy to set up and best sleep we have had in years!!! This is the most comfortable bed I've ever slept in. I bought one for my airbnb and my guests rave about it in their reviews. After a pet accident on my bed late at night, I had to sleep in the guest suite, and discovered for myself how wonderful it is. So when I got my tax refund and needed a nw mattress, I didn't hesitate to buy one of these! I normally am a warm sleeper and I haven't found this mattress to be any hotter than my old pillow top. My only complaint is that I now have trouble getting up in the morning because I never want to leave the comfy bed! 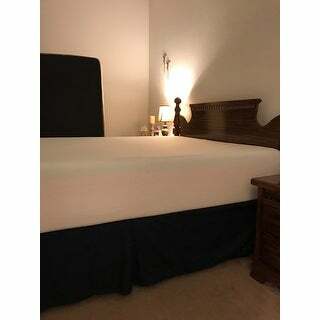 This mattress is extremely comfortable , we originally purchased for our guest room and so far, the feedback is great. When they leave they will always ask what type of bed it was. This bed is incredibly soft, has absolutely no support, gives me and my fiance a lot of back pain. It also generates a lot of heat sleeping on it. We'll have the house temp set to low 60's but still will sweat from this mattress. Overall, I think this is the most uncomfortable mattress I've ever slept on. this was the easiest mattress purchase I've ever made. the mattress was easy to unbox and let open for a day. It's not too firm and not too soft and best of all, it's never bone-chilling cold when I first get in after a cold winter day. This mattress is soooo soft and super comfortable! We had to replace our entire bedroom set and picked this mattress based on reviews and price. I'm glad we did. We have been sleeping like babies every since we started using this mattress. Bonus - it arrived super quick! Very happy with this purchase! Very comfortable I would highly recommend. "Can this be flipped if you need extra firm for awhile?" The mattress is not meant to be used in this manor. "Is the twin bed really 39” x 75”? Most twin bed frames are 38” x 75”." Yes, the twin is approximately 39 inches wide x 75 inches long x 12 inches thick. "how heavy weight for this materess"
"how far apart can slats be on platform"
"how far apart can the slats be on bed plate form"
"What is the warranty on this mattress?" Included Warranty: 10 year Limited Manufacturer. I hope it helps. "Does this mattress run hot?"